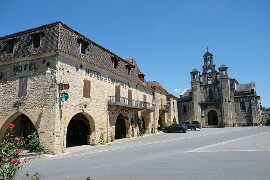 The Chateau de Biron is in the south of the Dordogne department near Monpazier. 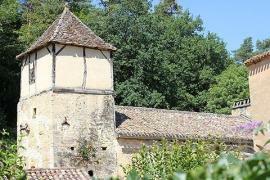 The chateau dates back to the 12th century and commands great views over the surrounding countryside. The Chateau de Biron has been in the Gontaut-Biron family from the 13th to the 20th century. 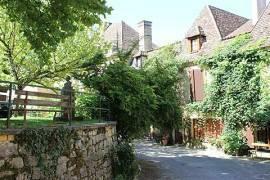 They were one of the four baronies of the Perigord along with Beynac, Bourdeilles and Mareuil. 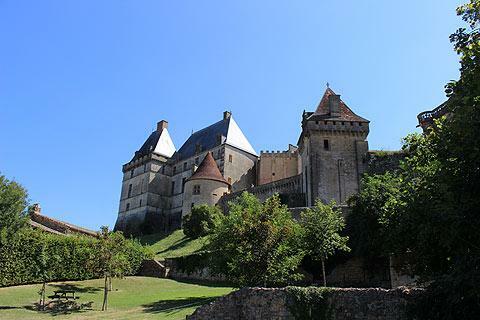 Over the years it endured various conflicts and damage but in the 15th century two Gontaut-Biron brothers restored and enlarged the castle in Italian Renaissance style mixed with a late flamboyant gothic style. Staircases and windows were added to the medieval towers. Building on the chapel began at the very end of the 15th century but work was slow and the chapel and appartments remained unfinished when the Wars of Religion broke out. Towards the end of the 16th century Charles de Gontaut plotted against King Henri IV and was beheaded in 1602. The Gontaut-Biron family were relegated from dukedom to barony and the chateau was empty until the 18th century when the family regained favour and completed the works on the castle. The French revolution changed the family fortunes again as the Duke of Biron was beheaded. The direct Gontaut-Biron line finished and the castle passed to a different branch of the family. In the 1920s the Marquis of Biron squandered much of the family fortunes on casinos and racecourses. Furniture was sold along with statues from the chapel, followed by various parts of the estate and finally in 1938 the castle itself. 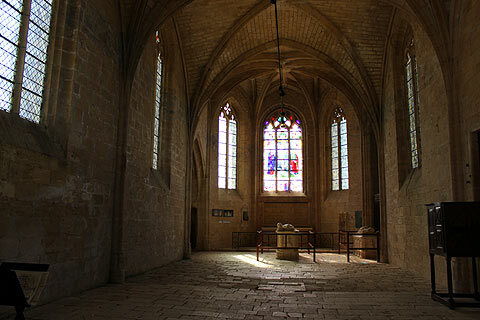 Two pieces of religious work from the castle of Biron can be seen in the Metropolitan Museum in New York! 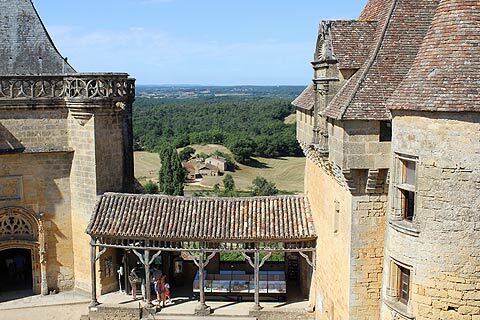 The chateau de Biron was then privately owned until it was bought by the Dordogne department in 1978 and it has been undergoing renovations ever since. The chateau is entered via an internal courtyard around which are the castle buildings, the caretakers tower and the church. You can see evidence of building from different periods with the church not having been built until the 16th at about the same time that the caretakers tower was being altered - including the addition of the lovely mullioned windows. The church is built on two floors. The upper level is at ground level of the chateau and was used by the lords of the castle. Below this is the church for the common folk of the village. This is now an exhibition space with local crafts displayed for sale. Pons de Gontaut-Biron and his brother Armand extended and made lots of changes to the castle at the end of the 15th century. They were heavily influenced by the Italian Renaissance style which Pons had seen whilst on campaigns in Italy. The tombs in the church are those of Pons and Armand. 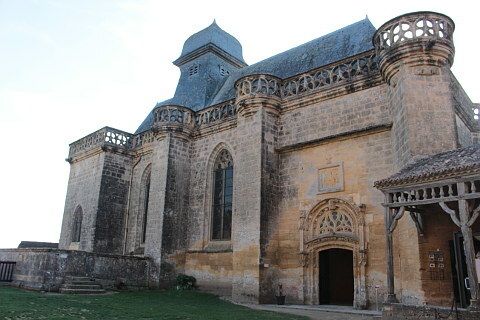 Armand also rebuilt Sarlat cathedral, Issigeac church and Bannes castle. 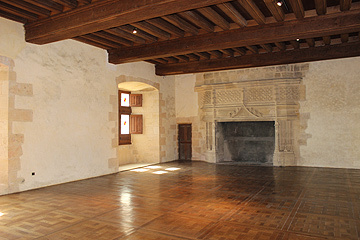 Inside the main residence of the castle are rooms with magnificent architectural details such as stone fireplaces, wood panelling, wooden ceilings and some fabulous floors. Some floors are made up of small terracotta tiles laid in beautiful square patterns and gleaming from the polishing of centuries of wear. 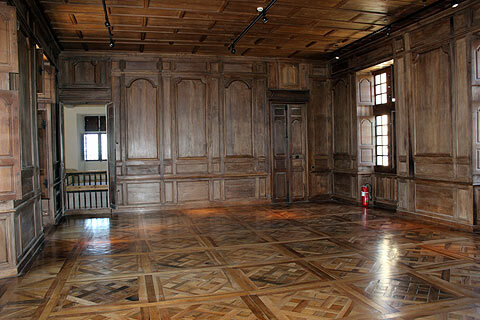 Above are rooms with wonderfully patterned wooden floors and to protect these you are asked to glide across the floors on felt squares. Also to see is the huge, vaulted kitchen. The other main building of the castle is currently being renovated and you can see the progess, it is going to look wonderful when finished. From here you walk along a covered walkway added in the 19th century to link the two towers. 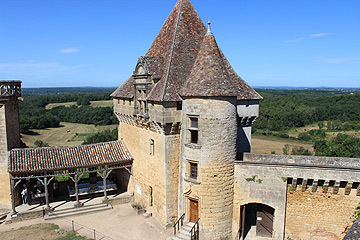 The Chateau de Biron has starred in a number of films including: Le Capitan, Vous n'aurez pas l'Alsace, La fille de d'Artagnan, La Pacte des Loups, Les Visiteurs 2, A tout jamais and Jacquou le Croquant. 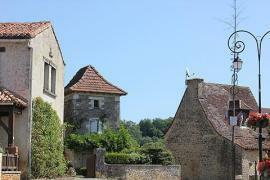 As well as visiting the Chateau de Biron take a look at the village of Biron too. It is small but charming. 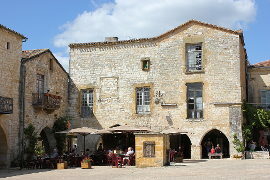 Near the castle is an auberge where you can stop for meals or drinks. Nearby is a beautiful priory which is also an upmarket bed and breakfast. Wander to the lower part of the village and there is a pretty cluster of houses and a church surrounding a well. 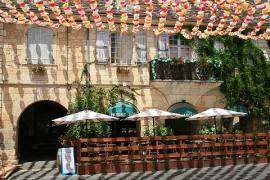 The beautiful village of Monpazier is close to Biron and definitely not to be missed. 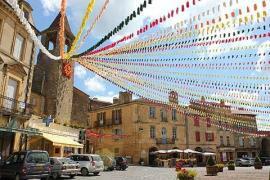 It really is one of the most beautiful villages in France. Travelling with children? 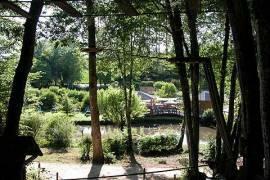 Or just fancy some excitement then the tree adventure park, Parc-en-Ciel, at Lacapelle-Biron is worth visiting.